HF LINEAR AMPLIFIER 1000W BOARD WITH MOSFETS. AUTO BIAS SUPLLY: 12-13.8V. THIS IS HANDMADE HF LINEAR AMPLIFIER USING 4 SD2933 ORIGINAL MOSFETS IN PUSH PULL CLASS AB OPERATION. AUTO BIAS MEANS THAT WHEN YOU TRANSMIT (TX) THE BIAS AUTOMATIC GOES ON AND WHEN IN RECEIVE MODE (RX) THE BIAS IS OFF SO THE MOSFETS ARE OFF AND THERE IS NO HEAT. THE HEATSINK IS NOT INCLUDED. YOUCAN WATCH TEST VIDEO ON YOUTUBE. 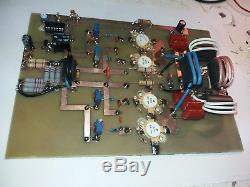 TITTLE: HF LINEAR AMPLIFIER 1KW SD2933 AUTO BIAS. ANY OTHER INFORMATION PLS CONTACT ME. The item "HF LINEAR AMPLIFIER 1000W WITH AUTO BIAS" is in sale since Sunday, February 11, 2018.